The Giesens further emphasised their foresight by supplementing the vintage with Sauvignon Blanc grapes from Marlborough, a region which would become one of the finest producers in the world. The path they would travel would not always be smooth but their perseverance and the belief in what they were doing was to reward the brothers handsomely. In 1988, Giesen Wines gained its first export order, sending Chardonnay and Sauvignon Blanc to Margaret Harvey in the United Kingdom. As it became increasingly obvious that Marlborough would evolve into one of the premium grape-growing regions of New Zealand, the Giesens widened their vineyard interests, purchasing the original Dillon's Point property in 1993. A year later, they had broken into the highly competitive Australian market, appointing Negociants Australia as their exclusive distributors. 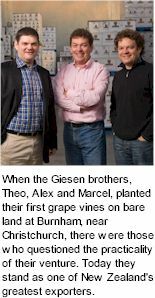 As the reputation of their wines spread, greater overseas interest in their label flourished, and in 1997, Giesen Wines were represented in the United States for the first time. Two years on, Giesen was in expansion mode, purchasing four separate vineyard blocks in Marlborough and building a new winery in Vernon St, Blenheim. In 1999, sales of Giesen Wines in Australia topped 3000 cases per annum. A year later, total case sales had soared to 23,000, and increasing volumes were heading to the United States, encouraging Giesen Wines to appoint Dreyfus Ashby and Co as its exclusive distributor there. Success bred even more success when in 2001, Giesens' Marlborough operation was broadened with the development of a 300-acre vineyard at Dillon's Point, Blenheim, sales had doubled to more than 50,000 cases. As its property portfolio expanded, so too did production, until in 2004, sales exceeded 100,000 cases per annum for the first time. With the growing demand for its wines, particularly in the Australian market, the company moved to larger premises and invested in a bottling and packaging facility at Christchurch, whilst expanding its winery and tank capacity in Blenheim. Low yielding vines grown to a cool climate is what makes Giesen's wines so unique. Complex fruit aromas make them enjoyable whilst young, refreshing acidity gives the wines backbone for long aging in the bottle. 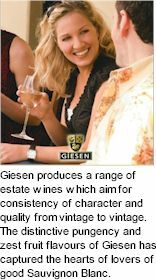 Giesen produces a range of estate wines which aim for consistency of character and quality from vintage to vintage. This range includes a luscious, intensely flavoured Riesling, a vibrant, refreshing Sauvignon Blanc, a complex yet elegant Chardonnay and a succulent, fruit driven Pinot Noir. Most vintages produce parcels of fruit or batches of wine of superior quality. These are bottled under a Reserve or Single Vineyard selection label. This range also includes a Riesling, Sauvignon Blanc, Chardonnay and Pinot Noir. The style may vary from one vintage to the next as determined by the season, however they will all display individuality and quality. Twenty-six years have passed since the first Giesen vines were planted in the stony ground of Burnham and the doubters have long ago had to swallow their words. Theo, Alex and Marcel have etched their names in the legend of New Zealand winemaking. Ignoring all detractors, they have been steadfast pioneers of a now booming industry in which they continue to be leaders and innovators.